Remember the scene from ‘Zindagi Na Milegi Dubaara’ where Hrithik Roshan takes the leap of faith to do the scuba diving. And, he comes out with the stunned reaction? Well it is indeed the most liberating experience. Underwater sports can really leave you speechless. You may even come out as a complete different personality. Entering the colorful world of aquatics, swirling inside water with gigantic coral reefs or be on top of the ocean waves, it leaves you in astonishment of its magnanimous untouched beauty. With summer holidays lined up, many of us plan family trip or getaway with friends somewhere near coast line. And, water sports are the best way to enjoy the beauty of beaches and rivers of India especially during summers. Thrilling water sports like para- sailing, snorkeling and diving, kayaking, scuba-diving, rafting; beaches and riversides in India have plethora of options for you to have best summertime memories. To feel a little affluent while enjoying the beauty of vast Blue Ocean, Yatch ride is the most lavish experience of all the water sports. While you bask in the sunlight let your Yatch prance around Arabian Sea. There isn’t much of an adrenaline rush going here but it sure is something that gives you the peace of mind which is often missing when surrounded with concrete jungle of cities. Goa has some of the best options to cruise on the Arabian Sea while enjoying activities like sun bathing, fishing, fine dining and of course romancing. Best places to plan a yatch trip are to Miramar Beach, Candolim Beach, etc preferably in October. Kayaking on high or low tides? Kayaking is a sport of extreme approach. It either offers thrill equivalent of dangerous rapids of river Ganga or can be as quite as Static Ocean. It’s a sport that appeals to all water lovers. Whether you choose to go wild on river or coy on ocean it can be a great way to explore archipelagos or find secluded beaches along the shore. Whatever type of kayaking you are interested in, you can find a perfect place to do it in India. Bhramputra River, Rishikesh, Kerala black water are some of the destinations you can explore for the same. Windsurfing usually popular amongst the foreign travelers is the one of the exciting water sports one must try. It takes a skill to do this sport. With this you get a surfboard sized between 2m and 5 m which need to be powered along the force of wind on the sail. Windsurfer has to be maneuvered by tilting and swiveling action of mast and sail and the listing and cutting motion of the board. The control of the board depends much on one’s skill of wind and water conditions. This kind of sports needs a lot of strength and agility. Hence, you better work on the beach body you have been procrastinating all winters. Water skiing is another water sports usually popular amongst the travelers from abroad, but again should not be missed. This wave hitting sport is played on surf board, which is tied to a boat at one end while other lies on surf board through a rope. This sport is all about maintaining balance once the speed boat hits off. As exhilarating this activity is can also be harmful if proper protection gears are not worn. So always wear a life jacket, follow the instruction no need to become Rambo here. Scuba diving is perhaps the only water sports that pump the exhilaration in the most peaceful manner. This sports allows you to get close with the wonders and the secrets of aquatic world. Varied colors and creatures this world has to offer is beyond imagination. SCUBA is a short form of ‘Self Contained Underwater Breathing Apparatus’ which offers the most ethereal experience of all time. Rishikesh is highly popular for river rafting and various other river associated activities. However, rafting is one of the high-adrenaline sport of navigating a river in an inflatable raft, involves several levels of difficulty, depending on how choppy the river is. It is the most challenging and fun activity. All you need to do is follow the safety tip advised by the instructor. While all these water sports can be interesting, often we miss to record the same because we do not our DSLRs or phone cameras are not water resistant. Here’s where the waterproof action camera comes into play. With our series of action camera Procus Rush and Epic you can enjoy and record all your underwater summer time memories. Realize all your Disney dreams. Remember the show little mermaid. We all used to go gaga over it. You can always re-live those moments by wearing the mermaid straps and go underwater. 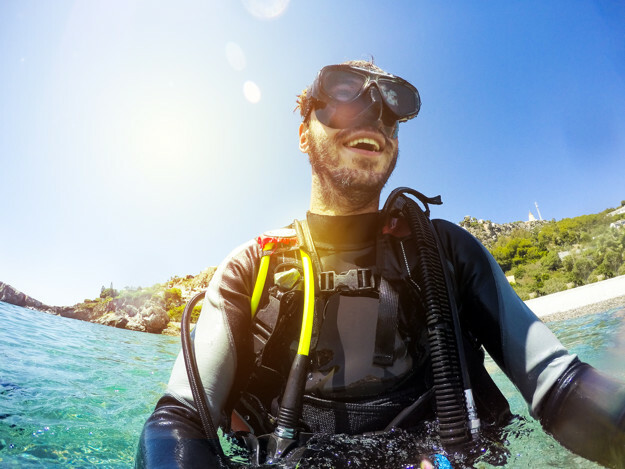 With our water proof action camera you can record your dream deep underwater. And, if you are one of those who take destination wedding to next level, you can also try underwater wedding. Hey! We only suggest it’s you who has to decide. Irrespective of above do share your underwater experiences with us in the comment box below. Procus has crossed the 2,00,000 customers milestone! Excited to welcome you to our big happy family. We would like to thank you for trusting in our brand and purchasing from us.